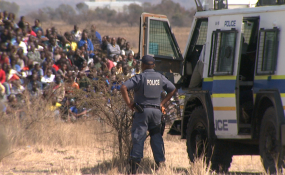 Police keeping watch on the striking miners (file photo). The 2012 Marikana massacre in South Africa's North West Province, in which 34 miners were killed by the police, remains an unhealed scar in post democratic South Africa. Two of the most important unresolved issues involve accountability and reparations. Organisations such as Amnesty International have long called on the South African government to ensure that all those suspected of criminal responsibility for the killings are prosecuted. This is about more than justice. It speaks to the heart of the government's credibility and legitimacy. As academic and political analyst William Gumede has argued, if democratic institutions aren't responsive and accountable, ordinary people will increasingly look to new ones, including populist groupings. Alternatively, they will seek answers in violence. Accountability for crimes committed by the state is crucial for upholding the rule of law and restoring trust in government. President Cyril Ramaphosa told Parliament in February 2018 that "the Marikana tragedy stands out as the darkest moment in the life of our young democracy". And in his maiden state of the nation address he promised a new spirit of accountability on his watch. It's vital for his credibility that these words be followed by action. Initiating prosecutions would show that he is serious about his intention to strengthen accountability. Ramaphosa has also pledged that government must finalise reparations for the families of striking miners killed by police. Although a settlement of R100 million was recently reached with the families, it can be argued that much more remains to be compensated. The protracted negotiations have left families financially and emotionally frustrated. In the six years since the massacre, the findings of the 2015 Farlam Commission of Inquiry can be described as the main form of accountability. The commission laid the blame squarely at the feet of the South African police. The establishment of the commission was always supposed to be only the first step on the road towards accountability. Government's follow up actions on its findings were dismally disappointing. It took until early this year for criminal prosecutions to be initiated. Six senior police officials now face charges, among them murder, attempted murder, and obstructing the ends of justice. The fact that the prosecutions followed hot on the heels of Ramaphosa's statements in Parliament suggests that the National Prosecuting Authority is finally taking heed of his call for accountability. The initiation of the prosecutions has been positively received by South African civil society, as well as by international groups. The newly appointed acting national head of public prosecutions should move to prioritise more people responsible for the massacre. There's no doubt that the R100 million settlement for victims' families is a positive development. But families of the victims have said that reparations should include a formal apology from the police minister, criminal charges against the police and financial compensation. In 2015 the families of 37 mine workers filed a civil claim against then police minister Nathi Nhleko. At the time, people expressed hope that the minister would consider an out of court settlement. Two years later the government concluded a loss-of-support settlement of R3.9-million with the family of one of those killed in the massacre. But to date, most of the settlement agreements have yet to be finalised. Ramaphosa's words earlier this year were encouraging. He is showing that he intends to uphold the Constitution and the rule of law. There's a great deal at stake for the president. Though he was exonerated by the Farlam Commission, he was personally implicated in the shooting that investigated the massacre given his role at the time as a non-executive director at Lonmin's platinum mines. He wrote a series of emails in which he called for stronger action from government to bring the strike to an end. Ramaphosa has been repeatedly attacked by opposition parties, most notably the Economic Freedom Front, for his stance during the strike. He has denied responsibility although he's never explained the exact nature of his involvement. But he does, finally seem, to be acknowledging the ongoing exploitation of miners. It's hoped that this will lead to policies that won't only compensate the families of Marikana's victims, but also result in a more humane living standards for mine workers.